What effects are herbicides having upon Kentucky’s trees and waterways? Are local wetlands effectively protecting the environment? Undergraduate students in Northern Kentucky University’s College of Arts and Sciences are conducting research on those topics – and their work is among the best in Kentucky and Tennessee, a professional environmental group has judged. “We are very proud of our students, and pleased that their hard work has been recognized by environmental professionals,” said Kristine Hopfensperger, director of NKU’s Environmental Science Program. The awards were given at the KY/TN Water Professionals Conference, held in Covington. 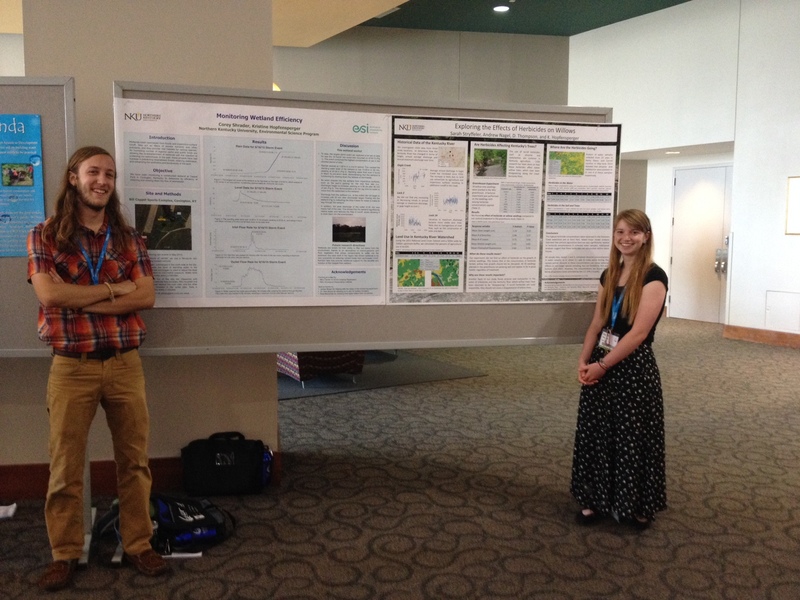 NKU physics major Sarah Stryffeler, 20, of Burlington, won second place for her research about the effects of herbicides upon willows in the Kentucky River watershed. The research was co-authored by recent environmental science graduate Andrew Nagel and Biology professors David Thompson and Hopfensperger. Stryffeler and her co-authors found that while potentially harmful no-till pesticides are present in the Kentucky River and its tributaries, they cannot be conclusively linked to the disappearance of willows along the lower Kentucky River. Computer science major Corey Shrader, 20, of Anderson Township won third place for his research monitoring the efficiency of a wetland at Covington’s Bill Cappel Sports Complex. The research was co-authored by Hopfensperger. Shrader is pursuing a minor in Environmental Studies. Shrader and his co-authors found that the constructed wetland is retaining and slowing the flow of stormwater the way that it should, research that the authors hope convinces other parks in the area to construct their own wetlands. Students from across Kentucky and Tennessee traveled to the water professionals’ conference to present their research in poster format. For more information, visit www.kytnwpc.org.